Tempelhof is an iconic airport in central Berlin, famous for the striking architecture of its vast, crescent-shaped terminal building. Since 2015, when hundreds of thousands of refugees arrived in Germany, Tempelhof has served as an accommodation center for them. The refugees now live in container homes, but between 2015 and 2017 they were housed in hangars—it was a huge logistical operation. 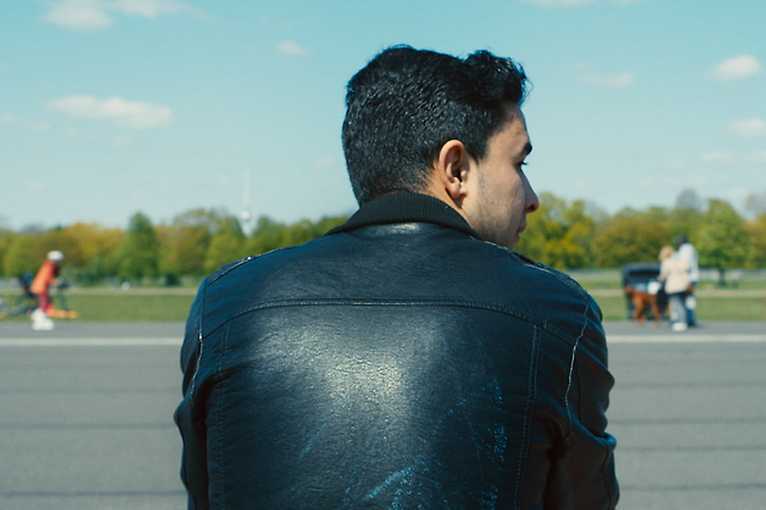 The 18-year-old Ibrahim is one of Tempelhof’s temporary residents. In voice-over, he talks about his memories of his village in Syria and his journey to Europe. Central Airport THF loosely follows his story, and that of an experienced surgeon who offers a listening ear to his Syrian compatriots. Over a hallucinatory soundtrack, mostly static shots document day-to-day life: doctor appointments, language lessons, a cigarette. It’s as if the film is trying to provide a counterbalance to the chaos that will perhaps dominate people’s memories of this time in their lives. The daily routine of the refugees in the hangars contrasts with that of the Berliners and tourists relaxing in the enormous Tempelhof Park. And so the months slip by. It takes little effort for Tempelhof itself to make an impression. As a strict but safe haven, it opens its arms to everyone.